In colonial times drowning was so rife it was known as 'the New Zealand death'. This jaunty 1951 educational film is an effort to rid our lakes, rivers and seas of the unfortunate tag through cunning reverse psychology, as swimmers, fishermen and skylarking lads learn "how to drown". It eschews the confrontational realism of many a later PSA for the light-hearted approach: mixing lessons on water safety with silent film-style tomfoolery, gallows humour and the odd bit of sexual innuendo. 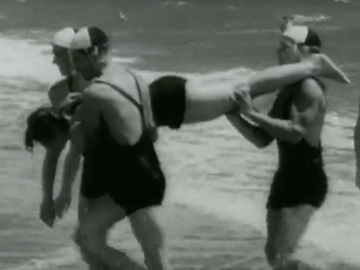 Features footage of surf lifesavers using the now-archaic rope and reel. Swimming Lessons is the story of jaded swimming coach Jim Sadler (Marshall - Came a Hot Friday, The Navigator - Napier) and a spirited seven-year-old delinquent who comes under his instruction. The troubled Samoan boy is a potential champion, but the challenges of training him force the coach to confront his own failings in life: one as seemingly straight as the pool's lane line. Directed by Steve La Hood, Swimming Lessons won two NZ TV Awards. It screened as part of Montana Sunday Theatre and was the TV producing debut for Philippa Campbell.